Margaret Thatcher’s isolation over Westland and the US bombing of Libya – as well as fears about the standards of her driving – are among the subjects revealed within 40,000 pages of her papers opening to the public today at the Churchill Archives Centre. For the first time the issue of “succession” had been dramatically raised. 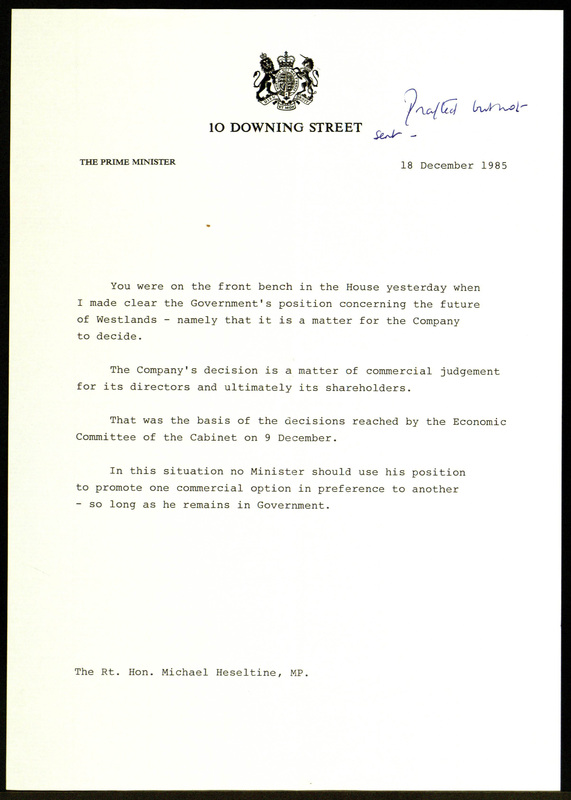 The Prime Minister’s personal papers for the year 1986, held at Churchill College, reveal the significant and ongoing fallout from the Westland affair – which prompted the resignation of Defence Minister Michael Heseltine, who went on to challenge Thatcher for the Tory leadership in 1990. The affair was bruising disagreement between Thatcher and Heseltine over a proposed rescue package for the UK’s last helicopter manufacturer – Westland. Heseltine favoured a European-based rescue package, while the PM favoured a US deal, with both sides using the press to brief against the other. Heseltine famously stormed out of a Cabinet meeting and resigned on January 9, 1986, accusing the Prime Minister of having lied during the course of the conflict. In many respects, 1986 was defined by Westland. Much happened in its shadow or was judged a consequence of it. It was also a genuine contest for power in the Conservative Party, one that Thatcher came close to losing. Included in the archives, a day after the resignation, is a warning from her Political Secretary, Stephen Sherbourne, that she must be seen to be in control of events as they unfolded, not merely a bystander. “People want Prime Ministers to be in charge and they expect that from you,” says his letter. Also among the papers being released today are those which reveal the scale of opposition for her support of President Reagan’s April bombing of Libya – including that of Norman Tebbit, Conservative Party Chairman, and historically one of Thatcher’s key supporters. 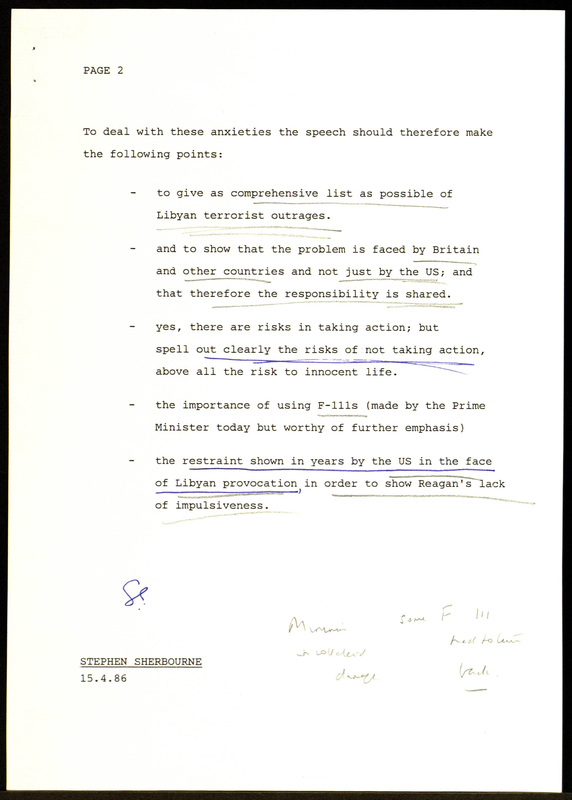 The clear and continuing discord between the pair makes for uncomfortable reading according to Collins, with Tebbit and other leading figures such as Deputy PM Willie Whitelaw, Foreign Secretary Geoffrey Howe and Chancellor Nigel Lawson among those vocal in their opposition to giving the US administration what they considered to be a ‘blank cheque’ in prosecuting its bombing campaign against Colonel Gaddafi’s Libya. American F-111 bomber aircraft stationed at RAF Lakenheath were used in the raids on the Libyan capital Tripoli, which proved highly controversial in Britain. The raids gained major exposure thanks to the reporting of BBC journalist Kate Adie who was considered to have covered the story coolly and critically from Tripoli. The BBC coverage enraged Tebbit who launched a prolonged counterattack which alarmed Number Ten in both its style and substance. Once among Thatcher’s closest allies, by 1986, their relationship had deteriorated remarkably. 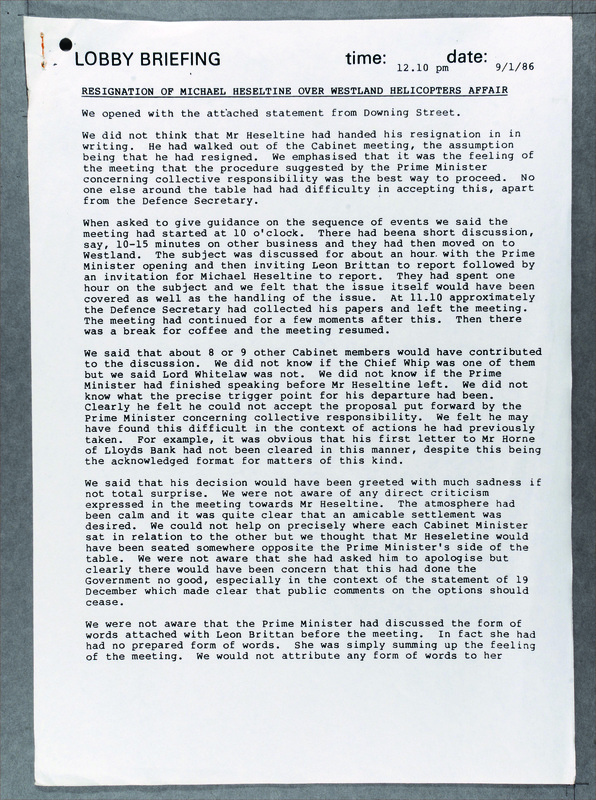 Tebbit’s attacks on the BBC became so severe, and riled Home Secretary Douglas Hurd so much, that Nigel Wicks, Thatcher’s Personal Private Secretary, warned the PM that Tebbit’s ‘obsession’ with the BBC coverage risked repeating elements of the Westland affair all over again – going against the collective responsibility of the Government when things had appeared to be settling down. 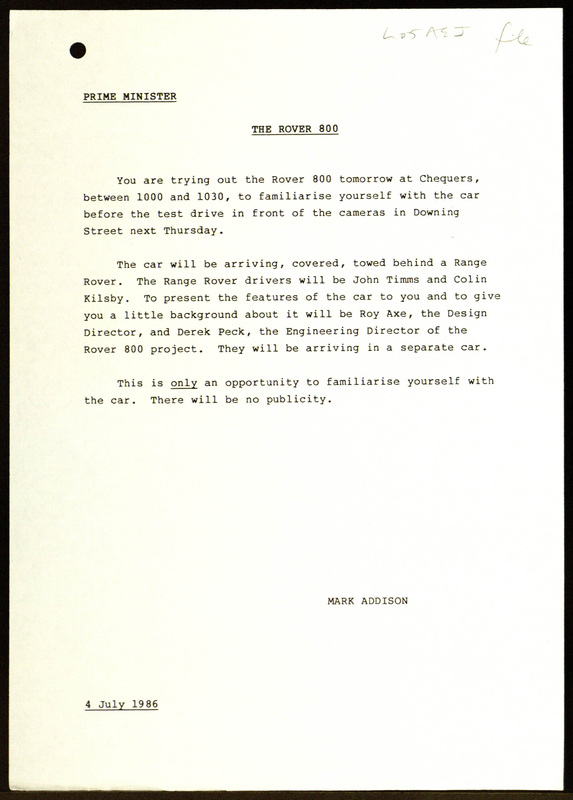 Alongside larger worries about national and international affairs, the papers for 1986 also record the concerns of Mrs Thatcher’s advisors when it to plans for the Prime Minister to test drive the new Rover 800 in Downing Street – all in the name of lending a hand to the ailing car manufacturer British Leyland. A quiet rehearsal was arranged at Chequers, with the car towed secretively under cover, while plans for the Downing Street drive were formalised. In the end, perhaps buoyed by her experience at Chequers, Mrs Thatcher not only drove the car along Downing Street, but also reversed it, pulling off the manoeuvre flawlessly in front of the assembled press. 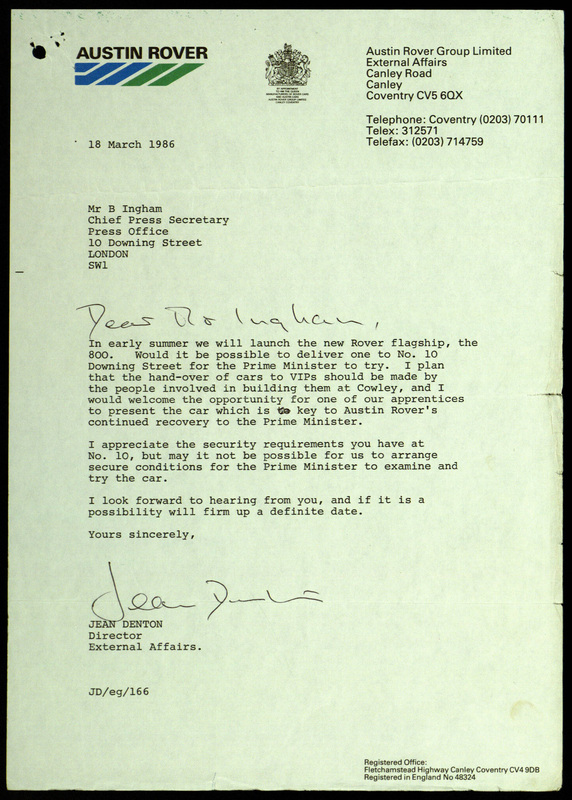 Rover, rather cackhandedly, later attempted to sell her a discounted car under their “VIP Preferential Purchase Scheme”. The offer was never taken up. 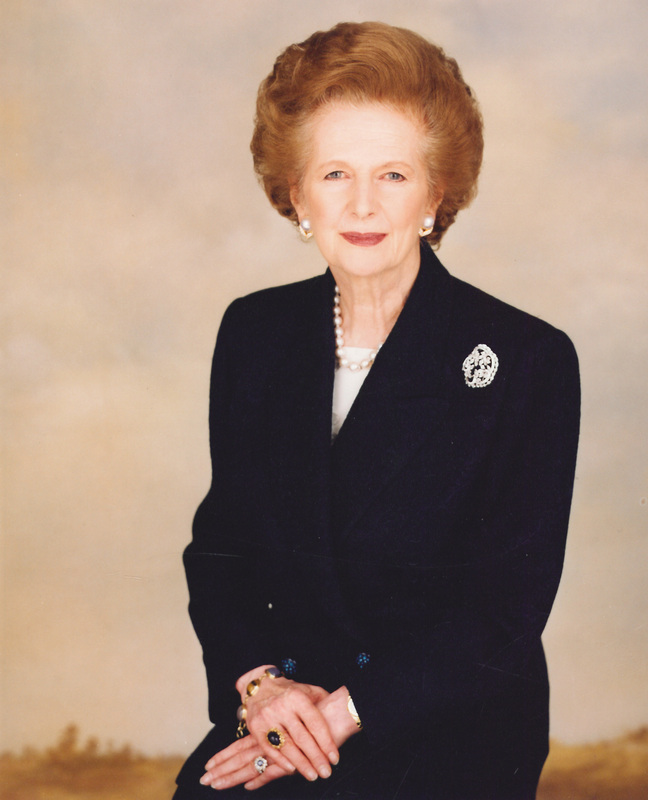 Andrew Riley, Archivist of the Thatcher papers at the Churchill Archives Centre, said: “Margaret Thatcher’s personal papers for 1986, released for the first time today at Churchill Archives Centre, provide unique insights into a year which ultimately proved to date a little over half way into her Premiership. Of course, no one knew in 1986 just how long she would stay at Downing Street but for the first time the issue of “succession” had been dramatically raised.